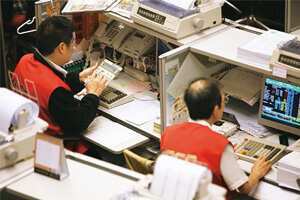 Tokyo: Asian stocks fell, dragging the MSCI Asia Pacific Index to a one-month low, as concerns that the economic recovery will falter caused auto makers and mining shares to drop. Treasurys and the yen rose as demand for haven assets increased. Toyota Motor Corp., which gets 31% of its revenue in North America, retreated 3.7% in Tokyo after its US sales slumped last month. BHP Billiton Ltd, the world’s biggest mining company, sank 2.7% in Sydney after metal prices dropped. Yields on 10-year treasurys fell to the lowest level since May and the yen extended gains after CIT Group Inc. said it may file for bankruptcy protection. Indian markets were closed on Friday. The MSCI Asia Pacific Index lost 2.1% to 114.39 in Tokyo, the lowest level since 7 September. The gauge has declined 2.9% this week, during which the measure capped its second straight quarterly advance. It has climbed 58% in the past seven months. “There seems to be growing consensus that the pace of the recovery will slow," said Kiyoshi Ishigane, a strategist at Mitsubishi UFJ Asset Management Co. Ltd, which oversees the equivalent of $56 billion (Rs2.68 trillion). Japan’s Nikkei 225 Stock Average slumped 2.5% even after the statistics bureau said the unemployment rate fell to 5.5% in August from a record 5.7% in July. Panasonic Corp. dropped 3.6% on a brokerage downgrade, while Aomori Bank Ltd tumbled 18% on share-sale plans. Disappointing US economic data and a Bank of Japan survey showing companies planned to further cut investment has put the MSCI Asia Pacific Index on course for its biggest weekly decline in more than a month.